Being a leader in the industry, we are engaged in providing a premium quality array of Pressure Plates. We are a leading supplier of TATA 709 Pressure Plates. - Original equipment to Tata Motors, Volvo-Eicher. 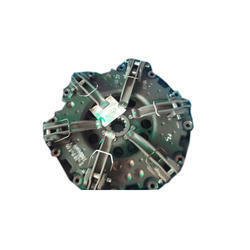 We are instrumental in manufacturing a precision designed range of Mechanical Press Spare Parts such as liner plate, pressure plate, slide adjustment screw and driving ring. These dimensionally accurate parts are available in various sizes and shapes and can also be customized as per the specifications of our clients. We offer Pressure Plate Assemblies that are manufactured with premium quality steel. Our whole range is user friendly, durable, reliable and provides flawless performance while functioning. Due to stringent quality checks at every stage of production, we offer clutches that deliver long lasting services and require minimum maintenance. Being a well-renowned entity, we are engaged in providing a distinguished range of Pressure Plate. Backed by rich industry experience and knowledge, we are engaged in manufacturing and supplying a large array of Pressure Plate. 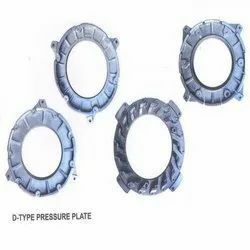 This plate is used to apply pressure to the clutch disc for transfer of torque to the transmission as is clear from its name. In addition, this product is designed and developed by our experts as per advanced manufacturing process using latest technology.